In Beijing there is plenty of Trappist beer but finding Westvleteren in Beijing was a surprise. Westvleteren is one of the recognized Trappist beers. See here the introduction by Listverse. In the silent halls of a 17th-century Trappist monastery, something dark is brewing. The Order of Cistercians of the Strict Observance, commonly referred to as the Trappists, is a monastic order that focuses on the work of one’s own hands as the true path to salvation. Although they don’t take an official vow of silence, Trappist monks avoid speaking unless absolutely necessary, and any speech that mocks or puts down someone else is a sin. All in all, they’re not bad fellows. But regardless of any religious affiliation, Trappist monks brew some of the meanest beers in the world. There are only 10 authentic Trappist breweries in the world, and six of those are in Belgium. Westvleteren XII, a Trappist beer brewed not far from the city of Ypres, is often called the best beer in the world. Everything the Trappists make from their beer goes back into their abbeys in accordance with their vow of poverty. A gold standard for beer connoisseurs, the Trappist ale in Westmalle Abbey streams through state-of-the-art equipment with not a monk in sight. VLETEREN, Belgium — On the face of it, this quaint Belgian town has few attractions — a charming brick parish church; a tall wooden windmill at the town’s main intersection. But it has the world’s best beer. In the past few years, several Web sites that ask beer drinkers to rate their favorite brews have accorded that honor to a strong, dark local brew known as Westvleteren 12. In fact, the enthusiastic American Web site RateBeer.com gave the beer the honor two years in a row, dethroning a Swedish dark beer, Närke Kaggen Stormaktsporter. 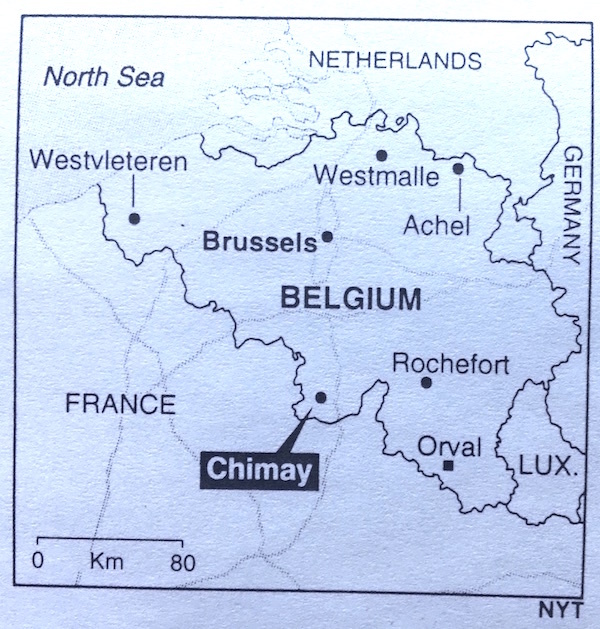 15 January 2003 – Chimay Journal; “Monks’ Brew Showers Blessings on Belgian Town” by John Tagliabue NYT. With his billowing white beard and black and white hooded habit, Dom Armand Veilleux, a Canadian-born monk in his mid-60’s, more resembles a figure from Umberto Eco’s novel of monastic mystery, ”The Name of the Rose,” than your average brewery executive. Yet just across a snow-dusted garden from the room where he receives visitors, a microbrewery throbs, its six huge stainless steel vats fermenting more than 13,000 gallons of beer a day. Only five years ago, the Trappist Abbey of Our Lady of Scourmont, where Dom Armand has been abbot for almost five years, turned out 15 percent less. But these days, Belgian Trappist beers — heavy brews, often dark and with as much as 9 percent alcohol — are surging in popularity, spreading blessings on the hilly farmland around Chimay, pop. 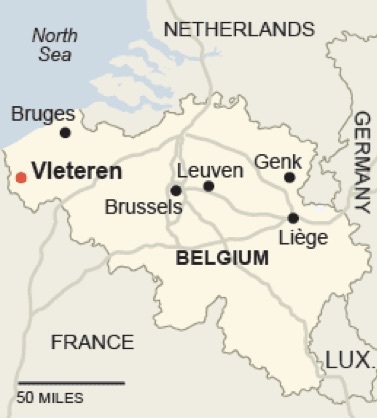 10,000, traditionally one of the poorer Belgian lands that snuggle against the French border. I was most surprised to find the beer online: RMB129. Then one evening I was in “Bottleshop”, on Xindong Street, close to Jiamei Dental, a small shop and bar with an impressive choice of top beers. There it was sold for RMB200. I decided to share my precious Trappist with Renaat Morel who knows all the little secrets of the brewing industry in Belgium. According to Renaat Westvleteren is pretty close to St. Bernardus Abt 12. I won’t dare to judge. I had never tasted the beer before as it it basically not available in Belgium, except if you queue up at the Abbey..